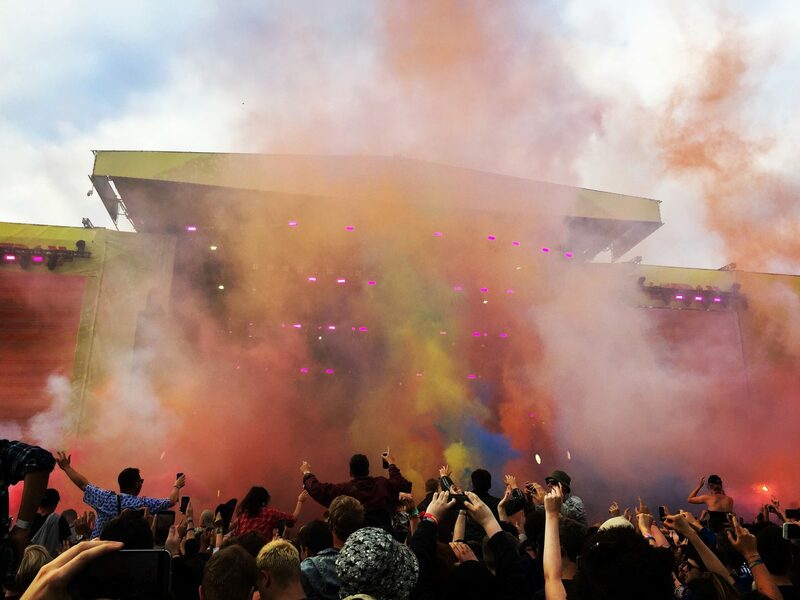 We are well and truly into festival season here in the UK, we’ve already seen Isle of Wight and Glastonbury pass us by, but we still have a few left to see us through the bank holiday weekend, including my favourite, Leeds Festival. Having attended 5 festivals (including Leeds 3 times) I feel like I’m pretty damn experienced and have got the essential packing list down. In this post I’ll share my top tips and packing essentials to tackle the great British weather. If you’re from the US and are used to the likes of Coachella, just close this post now, you will be baffled by the need for 10 packs of baby wipes, a fleece and a cagoule. A tent- Decathlon or Go Outdoors are your friend here, you can easily get a tent for £20 each split with a partner or friend- you don’t want to spend much as by the last day you WILL want to abandon it. Trust me, ain’t nobody got time to be trying to force a piss wet through pop-up tent back into a bag while it’s chucking it down with rain and you’ve got to walk across 7 muddy fields back to the car at 9am on a Monday morning. My other tip is to allow extra space, if you are sharing as a pair get a 3 or 4 man tent to accommodate for your bags and your booze and get one with a porch or space at the front to store your wellies and chairs at night while you sleep. A camp chair- Again the cheaper the better, get one from the Supermarket for a tenner because if you’re lucky and it makes to the last day you won’t want to carry it and much more likely it will get broken or stolen throughout the course of the weekend. Bedding- This one is up to you what you prefer but I’d recommend an airbed/ Self-inflating mat and a sleeping bag with a pillow. It may sound a lot but sleep is limited and it’s even worse when you have back ache because the ground is so uneven. FOR GOODNESS SAKE PACK A PUMP FOR THE AIRBED! A Gazebo- This isn’t a must but if you are going as large group or a group of 4 tents or more I would highly recommend. They offer shelter from the rain and are perfect for protecting the fire (if you’re allowed one). I literally dread to think what would have happened at Leeds last year without one because we had the worst weather ever for 5 days. Again, think disposable and pack Duct Tape to reinforce the joints when it gets windy/ drunken people fall into it. Amy ready for Y Not Festival last year. Okay so that’s most of the bulky stuff out of the way, if you can get one I would recommend getting some kind of trolley to wheel these items in on as most festivals have a long walk to the campsites, I know for sure Leeds fest does (Orange Hill is a bloody killer). Visit Cabin Zero here and get 10% off for the next 2 weeks using code CZWANDERINGMEG at checkout. Your tickets: You can carry you money, ID and phone in your bumbag but most tickets won’t fit, I like to put mine down my sock inside of my wellies as that way it’s very difficult for it to get lost or stolen while entering the festival. Clothes: Think cute but practical, you want denim shorts, vest tops and checked shirts alongside thick jumpers and pyjamas for sleeping in and venturing out at night, trust me it gets cold. Underwear and wellie socks: You don’t want your feet rubbing because they are literally all you will wear all weekend. Makeup/ Toiletres: Try to pack as light as you can, you won’t use half of what you expect to, a great way to save space would be to take travel miniatures. P. S. You think you will use the festival showers, but you won’t so don’t panic about bringing the whole contents of your bathroom. The exception here is glitter and faceprint, the more the better. Dry shampoo and deodorant: Dry shampoo is a must, I recommend strategic hairstyles e.g. : Day 1 normal hair left alone, Day 2 and 3 Plaits, Day 4 Messy bun, Day 5 you won’t even care you will just want to get home. Check the festival guidelines as many won’t allow aerosols over a certain size into the campsites for safety reasons. Food: Snacky foods for breakfast and round the campsite are a big must for me, you can get food from the vans but personally I never fancy a burger at 8am so breakfast bars and biscuits are key. Water and Alcohol: Obviously most people will take alcohol to a festival, the easiest are crates of cans like beer and cider and maybe a bottle of spirit decanted into a water bottle (No glass bottles are allowed). However most people forget water, pack at least a couple of bottles for brushing your teeth. You can also buy the collapsable 5 litre water carriers which you can fill up at taps, great for boys if they want to wash their hair without visiting the showers and for boiling off in a kettle (you can buy there) for cups of tea and pot noodles. A blanket/ Towel/ Shawl: I got mine (Pictured above) from Sandcloud and as it is lightweight it can be used to cover up your arms or legs if you get chilly by the fire but can also be taken into the arena to sit on in the daytime. You can also use the code MeganHarv25 for 25% off at checkout. Jeans and fleece are a must. The more glitter the better. Wellies, obviously not in your bag but just go wearing them, you will not need any other shoes (unless you’re the driver in which case leave the normal shoes in the car when you get there). Bin bags: To help keep the camp clean, to patch any leaks and to put around your pillow en-route to keep it clean. Duct Tape: To hold tents/ Gazebo’s/ Chairs together. A portable charger: Essential for keeping your phone going, although you can get a locker which supply a charging port at some festivals. Baby Wipes: Trust me, you will need these, you will get filthy, take 2 packets. A lighter: To light the fire (if allowed), at Leeds you can buy firelighters and wood blocks so all you need is the initial spark. Rain Coat: The brighter the better so your mates can see you when you all get lost, mine is bright yellow so you can’t miss me. This is where it might be worth spending more to get one that is actually waterproof as well as just fashionable. Sunglasses: Even if it’s raining they will stop the fire smoke blinding you constantly if it’s windy. Cystitis Sachets: Obviously just for the girls, if theres one place where a water infection can thrive, trust me it’s a festival, pack them just incase, you will be grateful if you need them. A toilet roll: To be carried in a bumbag as there is never any loo roll left after day 2. A bum bag: To carry all the essentials into the arena including your crappy fesitval phone, some money, some loo roll and portable charger. Hand Sanitiser: You don’t appreciate how much being able to wash your hands properly makes you feel clean but hand sanitiser is the next best thing. Me and my yellow coat enjoying the good old English weather. Similar coat here. Good Quality Wellies are something I would suggest. My Hunter’s have lasted me all 5 festivals and are still in perfect condition. Finally, the most important things to pack are your mates, cram em into your car along with all your stuff and you’re set for a fab weekend whatever the weather! Silly headgear/Fancy Dress are also important packing essentials. Let me know if you think I’ve missed anything or have any handy tips for any festival goers in the comments below! You may have noticed my posting schedule is a little out of whack this week, but I thought I would post this a day early so that anybody heading to the Festival with early-bird tickets have time for any last minute shopping. *This bag was kindly sent to me by Cabin Zero although all thoughts and opinions are my own. The above link is an affiliate link which can help me earn a small amount of money to help continue to produce blog posts. Thankyou! It’s so much fun!